← Cats, Computers, or Doctors: Who’s the best at predicting death? Mass suicide is not as uncommon as you’d think nor is it a modern phenomenon or even an event confined to crazed cults. Mass suicide is defined simply: when a large amount of people kill themselves at the same time. There are several different types of mass suicide events that can occur, each for a different reason and for different goals. The most infamous events of mass suicides are those that are related to religious groups or cults. These predominately occur when the group is being threatened and is close to being defeated causing them to resort to mass suicide instead of being captured. Another common reason that mass suicide can occur is due to a suicide pact being agreed on by a small group of people who are depressed or hopeless. Most times, the people participating have thought of committing suicide outside of the group setting and chose to do it with others for moral support. The third reason that people may choose to participate in a mass suicide is due to wanting to create a political statement or protest. Regardless of the circumstances, mass suicide creates a shock factor. They are not, however, always seen in a negative light as one might assume. A societies’ attitude towards mass suicide may change depending on the time, place or circumstances in which it took place. For example, people who chose mass suicide rather than giving into an oppressive regime or person are often seen in a heroic light. In comparison, mass suicides that take place because of a cult leader’s request are often seen in a more negative light. Mass suicide has been recorded in a magnitude of different cultures and under a variety of different circumstances. One of the earliest reordered examples of mass suicide is that of the people of Astapa in 206 BCE. They killed themselves and burned down their city knowing that they would inevitably be captured and their city destroyed by the Roman General Publius Cornelius Scipio. There is also a stereotype that mass suicide is performed at the request of or because of the leadership of a man, however history has shown this is not always the case. When the Turkish ruled Greece, the women in the town of Souli threw their children off a mountain and jumped after them in order to escape the Ottomans who were pursing them in event now known as the Dance of Zalongo. In some cultures, mass suicide has also been known to hold a ritual status. In Balinese culture, it is called puputan which means finishing or ending. It is symbolic and is often tied to theatre where it is seen as the ‘last act of a tragic dance-drama’. While it is easy to speculate what drives a large amount of people to commit suicide together, often times there is no one reason and many components play a role in driving the event. 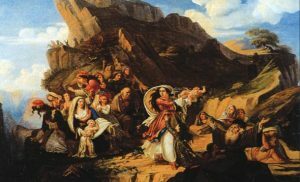 Zalongos Dance by Claude Pinet depicts the mass suicide of the women of Souli. This entry was posted in mass death, ritual, suicide and tagged mass death, mass suicide, ritual, suicide. Bookmark the permalink.